If you don’t have a reservation at Liholiho Yacht Club, go as soon as they open or risk standing to eat, which is exactly how I experienced the restaurant. Two thirds of the tables are for reservations, but a third and the bar area is opened to walk-ins. However, instead of taking down your name and managing the bar area, you’re instructed to stand behind people and grab a seat when you can find one. Not only did I feel awkward, but also bad for the people eating as well – having us breath down their necks. Instead, my friend and I decided to eat at the standing bar, essentially a ledge along a wall by the door. After all, if we’re going to be standing at the bar waiting, why not just stand and eat? I highly recommend the tuna poke ($15.50), what a great combination of freshness, powerful flavours and crunch. It actually made me happy while eating it! Hawaiian for ‘chunk’, poke is essentially tender cubes of raw tuna served in a salad form. 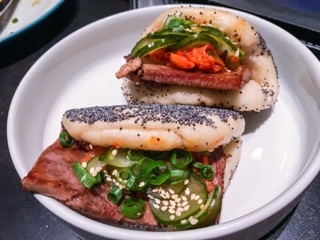 At Liholiho, they toss theirs in a fragrant sesame oil and soy sauce, adding dollops of aoili for an extra richness. The soft tuna and creamy sauces contrasts against a crispy deep fried nori that’s similar to a cracker, rather than the thin slivers adorning soba. Micro greens, green onions and toasted sesame seeds cut through the oiliness of the nori; each ingredient merging well to make a fantastic dish. 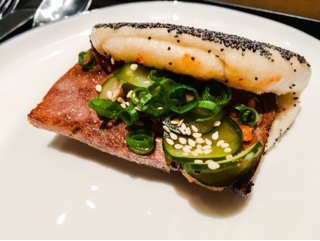 Although the meat in the beef tongue steam bun ($12.50) was succulent and full of flavour, once you hit the kimchi its heat completely takes over the dish. 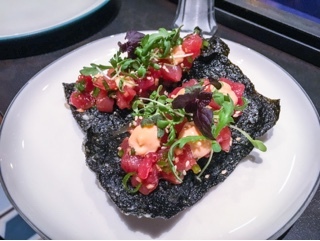 I would have much rather have it paired with a lighter condiment (maybe a sweet coffee sauce and the existing cucumbers), something related to Liholiho’s Hawaiian flare. Perhaps additional slices of tongue could help, to make the meat more prominent. 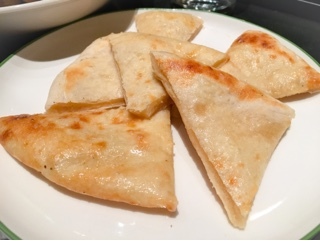 Indeed, it would aid in holding up against the doughy naan-like bun. Covered in poppy seeds, the bun is hit or miss depending if you prefer soft pillowy bread or the contrast it provides (I rather liked the seeds). However, it’s definitely not the most date friendly ingredient… there’s so many you’re bound to get one stuck in your teeth. 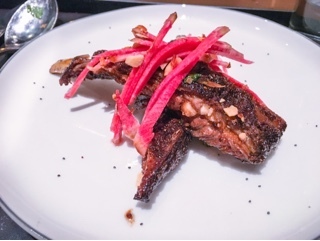 The glaze on the lamb ribs ($16.25) had such a great fragrance on it, especially when combined with the spice mixture. The typical gaminess of the lamb was neutralized by the slightly sweet black vinegar based glaze … so sticky that small pieces of crushed peanuts hold onto it. 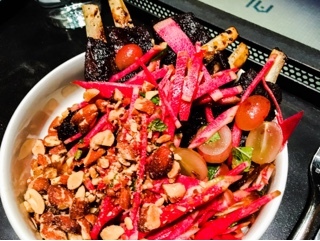 Everything topping the ribs – almonds, dates, grapes, radish and peanuts – was too much. I understand the Chef likely wanted to provide contrasting textures and flavours against the soft ribs, but I found it started taking away from the lamb: literally burying it under a mountain of secondary ingredients. 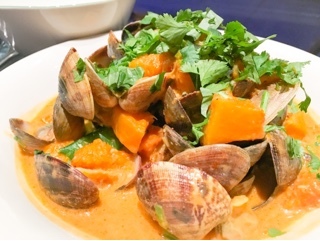 If the curry Manila clams ($25.75) was paired with steamed rice, rather than naan, it would be even better. The soft bread was heavy and all the garlic oil on it blocked the carb from soaking up the wonderful fragrant curry sauce. A cross between tom yum and coconut curry, the sauce had tons of heat that mellows out. With plenty of clams and loads of cubed butternut squash, the dish is rather substantial and heavy – something I didn’t expect from clams. Luckily, Liholiho added some crispy snap peas into the mixture; a great choice to lighten the dish a tad. Answering my own question of why would anyone just not stand and eat? Well, it makes any meal feel excruciatingly long. Although we were only there for about an hour, I was starting to get stiff and fidgety. Even though I really wanted to try their baked Hawaii for dessert, there was no chance of waiting another 20 minutes. As much as I’d like to say what matters for a restaurant is their food, your surroundings while having the meal really makes a difference. So, despite the food being inventive and delicious, one can only be so impressed when you back is sore and balancing a napkin on your knee. Therefore, heed my warning: get a reservation – if you can’t, make sure you go as soon as they open.